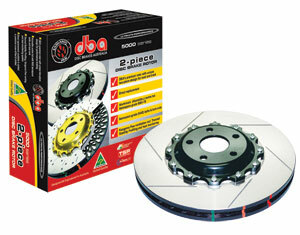 Thermo Stability Profiling or TSP allows DBA 4000 & 5000 series rotors to handle more extreme applications than standard rotors. TSP enhances the the microstructure of the disc resulting in greater thermal stability, improved brake pad & rotor life and delayed brake fade. Thermo-Graphic paint markings for effective heat monitoring and Kangaroo Paw ventilation which runs cooler, stronger and outperforms traditional straight vane disc rotors by up to 20%. The unique 6x6 Wiper Slot is designed to efficiently clear the gases, dust and debris, resulting in a cleaner disc surface for better braking while maintaining maximum friction. The 5000 series rotors (shown above) are a 2-piece ultra-high performance rotor made aerospace grade materials (Alumalite) for added thermal protection to your vehicle's wheel bearings, by providing greater resistance to distorion as it allows the disc to expand uniformly.